The teachings of Bill Salus have been featured on many popular Christian TV networks internationally, like TBN, CBN, and Daystar to name a few. To view some of these TV shows, click on the links below. These shows are not listed in any specific chronological order. CLICK HERE TO WATCH TBN’S SPECIAL “END TIME’S PRAISE” TV SHOW. The show was hosted by Perry Stone and featured Jonathan Cahn, Bill Salus and Mark Biltz. This television broadcast is on pace to be the most watched TV show in TBN’s 40 year history. The show aired internationally on March 9, 2015 and, due to its popularity, has been re-aired by TBN TV an unprecedented six times in the six months that followed. CLICK HERE to watch the timely 3-Part TV Prophecy Watchers TV show hosted by Gary Stearman with guest Bill Salus called, “Where Are You On the Prophetic Timeline?” These shows aired in the summer of 2015. CLICK HERE to watch “Iran’s Nuclear Program in Bible Prophecy.” This show aired on Prophecy in the News TV in the summer of 2015. CLICK HERE to watch “Is ISIS in Psalm 83, Jeremiah 49 and Isaiah 17?” This show aired on Prophecy in the News TV in the summer of 2015. 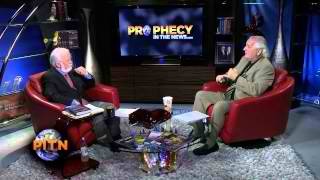 CLICK HERE to watch Bill Salus with Paul McGuire on God TV – Apocalypse & End Times. These shows aired in the summer of 2015. (The shows begin after the GOD TV advertisement). CLICK HERE to watch a 10 minute video about the Four Final Religions After the Rapture. This interview was conducted by Prophecy in the News TV with Bill Salus on July 9, 2015. CLICK HERE TO WATCH PITN TV Part One – “Will Israel Attack Iran in 2015?” Interview aired in January, 2015. 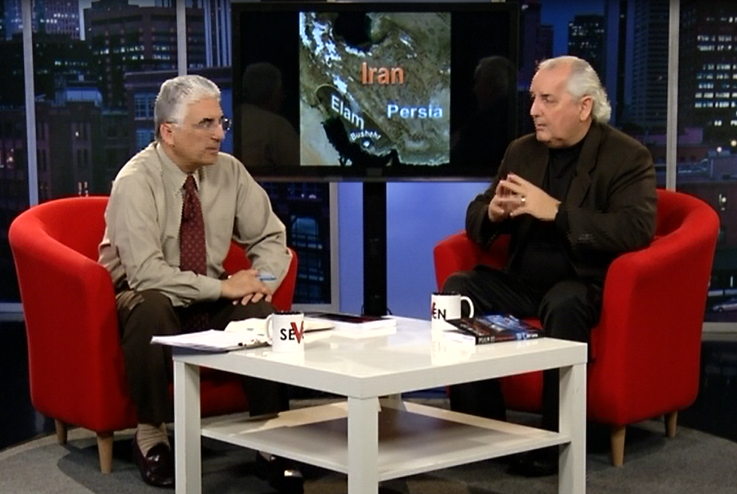 CLICK HERE TO WATCH PITN TV Part Two – “Is Iran’s Conversion to Christianity in the Bible?” Interview aired in January, 2015. CLICK HERE to watch “Iranians Learn About Psalm 83 and Ezekiel 38.” Hormoz Shariat, the Billy Graham of Iran, interviews Bill Salus about the pertinent Bible prophecies that will affect Iranians. Salus teaches while Shariat translates into Farsi. This TV show aired in May of 2014. CLICK HERE to watch “Iranians Learn About the Rapture and Elam (Iran).” Hormoz Shariat, the Billy Graham of Iran, interviews Bill Salus about the pertinent Bible prophecies that will affect Iranians. Salus teaches while Shariat translates into Farsi. This TV show aired in June of 2014. CLICK HERE TO WATCH “CBN TV – Does Prophecy Predict Iran’s Nuclear Disaster?” Erick Stakelbeck interviews Bill Salus on CBN TV about the biblical implications of Iran’s dangerous nuclear program. Bill explores the connection between Jeremiah’s prophecy of Elam and Iran’s nuclear program today. Interview was conducted in November, 2014. CLICK HERE TO WATCH “IRAN: Nuclear Showdown – Prophecy in the News.” This link features two TV shows hosted by Gary Stearman with Bill Salus as his guest. Interview was conducted in July, 2014. 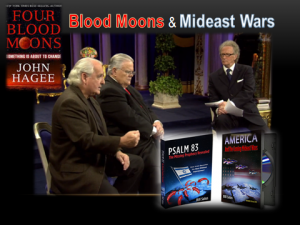 CLICK HERE TO WATCH “Watch 4 Blood Moons and Psalm 83 on TBN TV.” This show featured John Haggee’s book about the Blood Moons, and Bill Salus’s book about Psalm 83. Interview conducted in November, 2013. 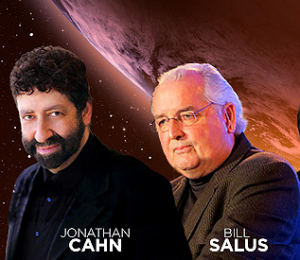 CLICK HERE TO WATCH JONATHAN CAHN AND BILL SALUS ON TBN’S APRIL 2013 PRAISE THE LORD PROGRAM CALLED “END TIME’S PRAISE.” Jonathan Cahn warns American’s about the impending peril about to befall the United States, and Bill Salus explains how the concluding Arab-Israeli war predicted in Psalm 83 is about to find final fulfillment. Moreover Bill explains why the Rapture is a Pre-Tribulational event. Additionally, Irwin Baxter argues for a Post-Tribulation Rapture on this program. This show is one of TBN’s most watched programs over the Internet at ITBN. Show was in April, 2013. CLICK HERE TO WATCH JONATHAN CAHN AND BILL SALUS (pictured left) ON THE TBN AUGUST 30, 2013 PRAISE THE LORD SHOW. 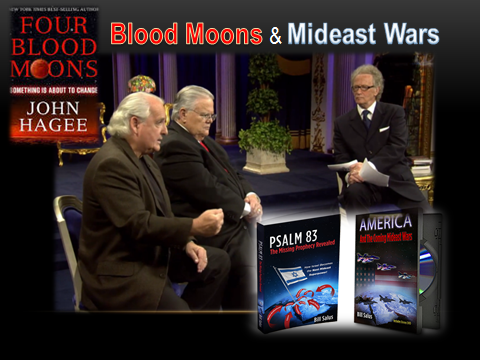 Jonathan and Bill discuss the 4 Blood Red Moons, Psalm 83, and America. Additionally, Bill identifies the future prophetic judgments against Syria. CLICK HERE TO WATCH “Mark Biltz & Bill Salus on TBN TV.” Show was in March, 2014. CLICK HERE TO WATCH Erick Stakelbeck interviews with Bill Koenig and Bill Salus. “Mideast Update: Edom, Elam, Magog, & Blood Moons.” (This link includes several TV programs). CLICK HERE TO WATCH THE NUCLEAR SHOWDOWN IN IRAN INTERVIEW WITH GARY STEARMAN IN AUGUST, 2014. Bill explains the theme of his latest book entitled, Nuclear Showdown in Iran, Revealing the Ancient Prophecy of Elam. CLICK HERE TO WATCH “CBN TV Interviews Bill Salus: The Nations Surrounding Israel.” Interview with CBN Jerusalem correspondent Chris Mitchell on February, 2014. 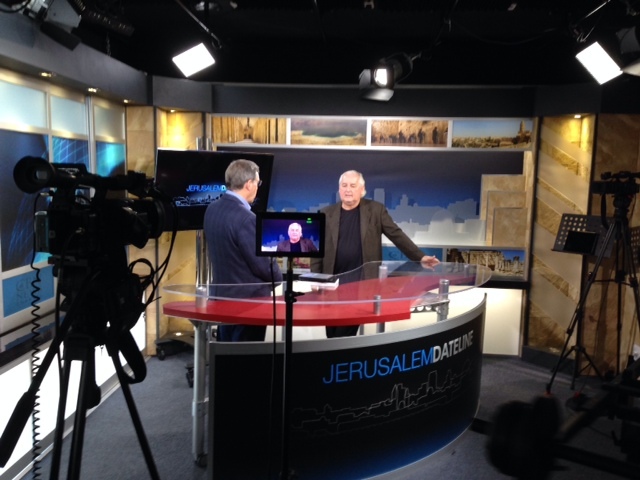 CLICK HERE TO WATCH “CBN TV Interviews Bill Salus: Why Study Prophecy?” Interview with CBN Jerusalem correspondent Chris Mitchell on February, 2014. CLICK HERE TO WATCH “CBN TV Interviews Bill Salus: Does Psalm 83 Predict an Imminent War?” Interview with CBN Jerusalem correspondent Chris Mitchell on Januaray, 2014. CLICK HERE TO GO “BEHIND THE SCENES” ON TBN TV WITH BILL COMMEMORATING THE 12 YEAR ANNIVERSARY OF 9/11/13. CLICK HERE TO GO “BEHIND THE SCENES” WITH TBN TV TO EXPLORE PSALM 83 ON 6/13/13.